One of the subsets of headaches that the implementation of Brexit brings in its wake is what the UK will do with its relations with China in the years ahead. At the moment, trade and investment agreements with the People’s Republic are largely conducted through frameworks put in place over the last few decades by the EU. That, after all, has been the principal conduit through which the UK, as a member, has related in economic terms not just with China but with the outside world. A trade deal with China will simply not be purely what it says in the title. It will need to be one with a massive political dimension, and a great deal of risk management built into it. A `clean break’ arrangement after next March with the EU would mean, in theory, that the UK could then proceed to forge a new set of arrangements bilaterally with China. That has been one of the great inducements offered by figures like Liam Fox, the International Trade Secretary, or, while he was still in post, former Foreign Secretary Boris Johnson. For them, Global Britain will be able to proceed into the wider world and create bespoke opportunities and arrangements with China and a host of other `high growth emerging markets’ (as they are sometimes called). It is true that the opportunities of providing the emerging middle class in China with services and other goods have great potential. Consumption levels in the country still remain low. Theoretically, as the Chinese economy continues to develop, and services and other areas develop, there will be a greater alignment with what the UK can offer. Its banking, financial services, insurers, healthcare providers, and educational partners can find new areas and new ways of working in the People’s Republic. The relationship will finally, after so much time and effort, have come of age, and China, currently the world’s second-largest economy, will occupy a position for the UK commensurate with that of Japan and South Korea, who have been significant investors here over the last decades. The unique added challenge of Sino-British relations developing post-Brexit along this kind of trajectory is, as ever, that unlike partners such as Japan and South Korea, China has clear political and security differences with the UK. The simple fact is that in the post-World War Two context, Britain’s closest economic partners are also ones it has been allies of. They have shared the same broad political values. In undertaking extensive trade enhancement with the US, Japan, and partners in the EU, political alignments and synergies could be assumed. The issue then became simply one of how to get a commercial deal that was beneficial to both. That alone made a potentially complex issue significantly more straightforward. With China, everything carries an extra political dimension. As a system in which a Communist Party holds a monopoly on power, and which clearly there are huge differences in values, social and cultural, the kind of deals the UK has been used to putting in place up till now are not fit for purpose. Setting up an arrangement that sees investment, trade and finance flows rise rapidly between the UK and China will need to address questions of different attitudes to security, the global order, and political and human rights. A trade deal with China will simply not be purely what it says in the title. It will need to be one with a massive political dimension, and a great deal of risk management built into it. This will be a formidably difficult framework to achieve and not one that will be able to set in place very quickly. The other stark issue is that, even if the UK and China were able to forge a new kind of relationship, and the tangible levels of commercial engagement between each side rose, that would almost certainly pose questions for our other economic and security allies. Technology, for instance, and intellectual property protection would post sharp challenges, with American or European partners wanting to ringfence what they share with the UK, or even refusing to work in some areas with us because of the new ways China is figuring in our economy. 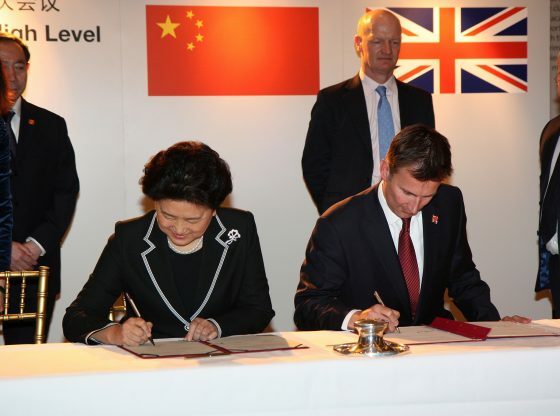 An outcome where Chinese investments are patchy and incoherent, and where even the modest existence of these causes the UK to be regarded as overexposed to Chinese economic and therefore political influence, and unreliable and untrusted by others, would be a huge price to pay – and one that would almost certainly lead to damaging outcomes for Britain. The only way to avoid this is to set up detailed, transparent, and robust systems of engagement which gain the confidence of British, Chinese and others. Even the most optimistic might regard that as a somewhat fanciful outcome. At the moment, the brute fact is that politicians who are largely not that knowledgeable about China, and with very little experience, have been setting up a chimerical vision of what might be possible. But as with so much of Brexit, they have not worked through the real detail of how to make these abstractions reality. We know that the UK-China relationship post-Brexit will change. And we have to hope and work on it changing positively. But we should not be naïve about the massive challenges of making this happen – and nor should they. Kerry Brown is Professor of Chinese Studies and Director of the Lau China Institute, King’s College, London, and Associate Fellow, Chatham House, London. He is the author of 20 books on China, the most recent of which is `China’s Dream: The Culture of the Communist Party and its Secret Sources of Power’ (Polity, Cambridge, 2018). Image Credit: CC by Foreign and Commonwealth Office/Flickr. On June 1, 2021, China will reach a human rights benchmark, Confucius’ Chinese Dream of a xiaokang society in which everyone without exception has a home, a job, plenty of food, education, safe streets, health and old age care. On that day there will be more poor women, imprisoned men and hungry children⁠ in America than in China and the world’s human rights priorities will begin to change. To follow the benchmark Chinese would kill, put people behind bars, send them to therapy like they are doing to Uyghurs and steal from US and the world, sounds similar to Brits what they did to India….and many other nations. So values may not be so far apart. We wish UK Good Luck on their new friendship. I think when the uk eventually leaves the EU block our small island will be able to trade with many other great countries including china, but production in my country still needs to go up. I think electric cars is the future and science makes us stand out from the rest of the world and we still make some amazing products.